Offering beautiful furnished apartments and executive rentals in Toronto, ON, Toronto Furnished Apartments is a leader in luxury suites and elegant condo short term rental solutions that fit each guest’s needs and lifestyle. Toronto executive rentals from Toronto Furnished Apartments offer guests a fully furnished unit with a full kitchen, separate bedroom(s), en-suite laundry, weekly housekeeping, security and other amenities depending on the location. 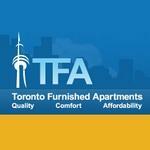 Products Carried: Toronto Furnished Apartments offers furnished apartments and short term condo rentals in Toronto, Ontario. Their units are fully furnished, with fully-equipped kitchens. Toronto Furnished Apartments offer studio, one and two bedroom suites to meet guests’ specific privacy needs.One of the greatest benefits of Toronto short-term rentals is that they feel like home. When I was travelling to Toronto, a friend recommended me to try staying at a furnished apartment instead of a hotel, and it was worth every penny. My room came with fully equipped kitchen utensils and a comfortable layout that reminded me of home. If you are in the Toronto area you should absolutely give this a shot.